What is that song that is sung at the end of a Kundalini Class? It is called the "Sunshine Song" - Yogi Bhajan, Master of Kundalini Yoga, founder of 3HO, thought that the Irish Blessing was a great way to end his classes. Therefore, the "Sunshine Song" became a tradition and is used in almost every Kundalini class at the end. it goes like this. A ll Love surround you. "OM" is not a word but an intonation, it is a sound. 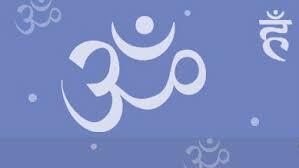 It is three Sanskrit letters, aa, au and ma which, when put together make the sound of "Aum" or "Om". It is said that it is the basic sound of the world and contains all other sounds. It is a 'mantra' or prayer. If repeated with the correct intonation, it resonates throughout the body and the sound will penetrate the center of one's being, the "atman" or 'soul". The symbol of "OM" is said to represent both the unmanifested and manifested aspects of God. It is called "pranava", meaning that it pervades life and runs through our prana or breath. Namaste is a 'reverent greeting" which is in simple terms "I bow to you." "I bow to the Divine in you" "The spirit within me salutes the spirit within you". "The Divine within me salutes the Divine within you". 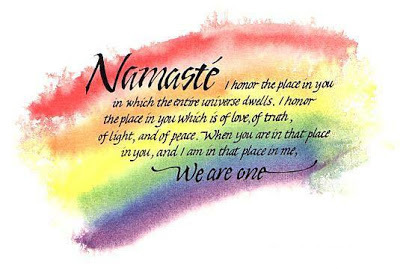 Namaste acknowledges the 'divine" in each person, it is a greeting of respect. One bows to that divinity in each person! "Namaste" has also been interpreted to mean: "The Christ in Me acknowledges the Christ in you" or, 'the Christ Light in me, acknowledges the Christ Light in you". I like to think of it as coming from the place of Love and recognizing that each person and that all of creation is Special! What does 'Sat Nam" mean? It comes from the Sikh Faith, Sat Nam is interpreted as: Truth is God's Name". Since it is said, God lives in us...then, we can say that "Truth is my identity". My identity is Truth" My True Self", Truth is our identity"...it is said, it is the "process of naming ones self Truth" or aligning oneself with God. In our world, when we say "he/she speaks their Truth" that is powerful, so think of how powerful it is to say/chant "SatNam". I look at it as we are all trying to find the "Truth" of our being and all of these words and mantras help us define our 'truth', our divinity with the Source, with our Creator, with God, whatever you want to call the "source" of our existnce.